I would like to take a few lines in this edition of the Newsletter to introduce a couple of members of the Decorfolia team. Margaret Samuel has now been with us for two years. She is the unseen member of the team dealing efficiently, but quietly, with the everyday running of our busy office. When she isn't looking after the rest of us she has a keen interest in local Christchurch history. Editing books that she helps her mother research on a number of interesting local topics. Our newest member of the service team is Mark Pearce, now as most of you already know we have Mark Fryer, so now they are known as Marks 1 & 2! Mark 2 as we call him has spent most of his working life in horticulture growing a number of crops including chrysthamums and tomatoes. He has two young sons that keep him fairly busy when he isn't working, and as I write this introduction to him he is in Tennessee with the family on a long planned holiday ? yihahh! 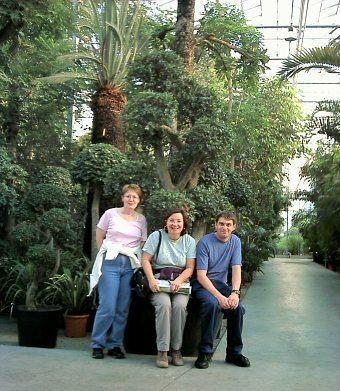 In this photograph, taken last Autumn on a trip to one of our main plant suppliers you can see both Margaret and Mark sitting with me under a small specimen 'cloud' tree!